According to the Forest Service, public viewing opportunities at the trap site will be available on a first come, first served basis for up to 14 people each day. Members of the public wishing to view the helicopters chasing wild horses into traps must arrive an hour and a half prior to gather activities at Forest Headquarters, 225 W. 8th St., in Alturas, follow forest personnel to the trap site and remain at the viewing location until operations are completed for the day. Viewers should bring plenty of water, lunch, stout footwear, hat and their own chair. There will be an approximate one-mile hike over rocky terrain from the parking area to each of the trap sites. The weather is expected to be hot and dry, and there is little shade available. Members of the public will be asked to remain in a blind in order to avoid disrupting gather activities. Safety of visitors, gather personnel and the horses is top priority. The use of drones in the area will not be allowed due to safety concerns. Public viewing will also be available at the temporary holding facility at Willow Creek Ranch, during the hours of 3–5 p.m. on days roundup activities occur. Operations may not occur every day, but as contractors determine. Anyone interested in viewing roundup operations at taxpayer expense should contact Public Affairs Officer Ken Sandusky at (530) 233-5811. Don’t take the wild out of wild horses! SALT LAKE CITY (AP) — The U.S. Bureau of Land Management’s plan to inject 50 wild horses in western Utah with contraception drugs to help control the population is being applauded by one wild horse advocacy group but derided by another. The American Wild Horse Preservation Campaign supports the plan, saying it is a more humane method than taking horses off their ranges, the Deseret News newspaper in Salt Lake City reports (http://bit.ly/1zCcWkw ). But the group Protect Mustangs says the anti-fertility drug can lead to sterilization and wreak havoc on natural selection. This marks the first time this method has been used in Utah. The BLM plans to begin injecting the drugs in the horses using darts in May, said spokeswoman Lisa Reid. It will continue with the project over a five-year span. The drug that will be used, called porcine zona pellucida, is most effective for one year, the BLM said. It is effective in preventing pregnancy in horses for one year, Reid said. The BLM says there are 317 wild horses in the Onaqui Mountain area about 60 miles southwest of Tooele. That’s more than double the appropriate level of 120. Statewide, there are about 4,300 wild horses and burros in Utah, above the appropriate management level of about 2,000, the agency said. Roundups are also expensive, said Gus Warr, Utah director of the BLM’s Wild Horse and Burro program. Helicopter roundups cost about $400 to $500 per horse while fertility drugs cost roughly $100 per horse, Warr said. The issue of wild horses has been a lightning rod across the West for years. Many ranchers claim the horses are overrunning the range, causing ecological damage and reducing grazing for livestock. They want the BLM to immediately round up excess horses. Bolbol, of the American Wild Horse Preservation Campaign, said she hopes BLM officials around the West use this method to keep herds at manageable levels. But Warr said the contraception plan won’t work in all Utah herds because of difficult terrain and skittish horses. Help Protect Mustangs continue to fight for wild horses with a donation via PayPal.com to Contact@ProtectMustangs.org or visit our website www.ProtectMustangs.org to join the organization. 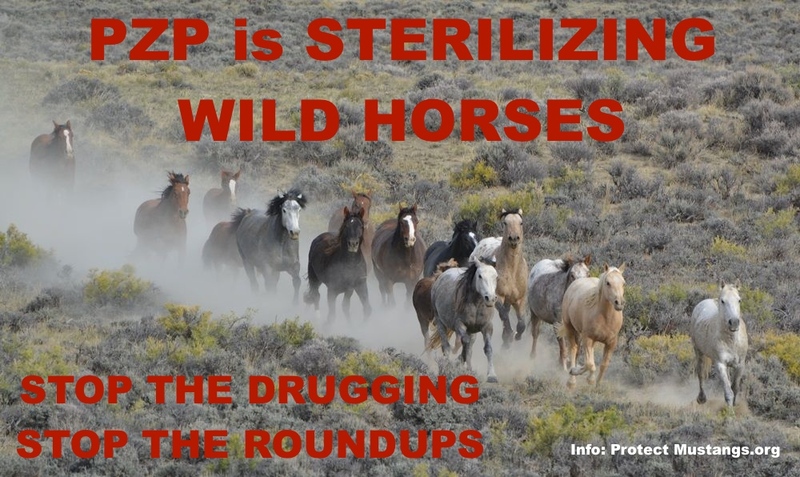 Together we can keep the wild in wild horses!